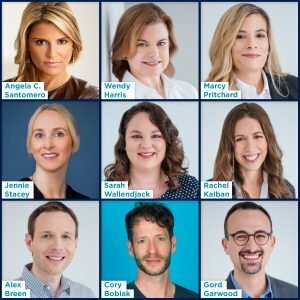 MIPJUNIOR: Canadian kids’ TV specialist 9 Story Media Group has made a series of hires and promotions in its creative team following its acquisition of Out of the Blue Enterprises earlier this year. The changes come under the new leadership of chief creative officer Angela C Santomero who was promoted in June following the acquisition of her Out of the Blue production shingle last year. Wendy Harris has been promoted to the newly created role of senior VP of content and creative affairs. She will report to Santomero and be based in 9 Story’s New York office. Harris is an award-winning children’s television executive producer and writer, starting on the original Blue’s Clues (which Santomero co-created). Harris has been with Out of the Blue since its inception in 2005. Marcy Pritchard is joining 9 Story’s New York team in the newly created role of senior VP of business and creative affairs. Pritchard will work closely with Santomero to grow the 9 Story USA office and streamline integration efforts with 9 Story’s Toronto and Dublin studios. Jennie Stacey is promoted to VP of development. Based in Dublin, Stacey will lead the company’s overall development efforts for original television series. Stacey has spearheaded many of the biggest hits at 9 Story-owned Brown Bag, including Henry Hugglemonster, Angela’s Christmas and Sadie Sparks for Disney Channel. Stacey first joined Brown Bag Films in 2008, after roles with RTE and Universal Pictures International in London. Sarah Wallendjack is stepping into the new role of VP of production and development NY, reporting into Harris. Wallendjack will work with the creative affairs team to oversee projects from development through production. Rachel Kalban, meanwhile, will continue in her role as VP of research and curriculum, reporting to Harris. Alex Breen has been promoted to VP, Interactive, reporting in to Pritchard. Changes are also being made to bolster the management and creative leadership at 9 Story’s Brown Bag Films studio, which works closely with 9 Story’s Creative Affairs team. Darragh O’Connell, co-founder of Brown Bag Films is now group creative director for the global studio, while Cory Bobiak (Peg + Cat, Xavier Riddle and the Secret Museum), a long-time director at Brown Bag Films/9 Story Media Group is promoted to the newly created role of creative director (Toronto). Bobiak will report into O’Connell and oversee creative direction within the Toronto studio. Additional promotions include Gillian Higgins to senior VP of production (Europe), Louise Cornally to senior VP of finance and business affairs and John Brady to VP of production technology. 9 Story has also announced several promotions at its international distribution company, 9 Story Distribution International. Alix Wiseman is promoted to senior VP of distribution and acquisitions, now overseeing global distribution and acquisitions efforts from the operation’s Dublin headquarters and reporting to Natalie Osborne (CCO). Stephen Kelley is promoted to VP of distribution (EMEA) and Federico Vargas is promoted to VP of distribution overseeing Asia Pacific, Latin America & Iberia.